Coding, just like any other language, is learned best at a young age. There are many ways to teach programming, however, the main challenge is how to explain abstract mathematical concepts like axis, parameters and variables to young children. Scratch, a programming language that was developed by MIT, rises to the challenge. It uses colorful animation to help illustrate difficult concepts and opens a door to the wonderful world of code. This introductory course invites kids to create games, videos and stories, while learning the foundations of coding so there’s no need for previous experience. Kids will get to know the Scratch learning environment, its friendly animated characters and cool graphic design tools. They will create fun games by dragging and dropping built-in blocks of code, which will help them implement the internal logic and structure of programming. When do our courses start? We have a few starting dates so you can choose the class that suits your child’s schedule best. Our next class starts on Sunday, April 28 at 3:50 PM. If you are interested in one of our classes click on the schedule below to start the registration process. We offer a risk-free trial period with a money back guarantee. Your registration fee is fully refundable during the 14 day trial period. At the end of your trial period, your preferred payment method will be charged monthly throughout the 9 month course period. What will give your child a head start? Register now to get 2 trial lessons! We offer a money back guarantee on all our courses. Your registration fee – ₪160 is fully refundable during the trial period and it includes 2 trial lessons. Our students love studying at Tekkie Uni. This is why we stand behind our courses and offer a money back guarantee. Following the trial period, you will be charged ₪348 monthly for 9 months. Want to speak to one of our advisors? 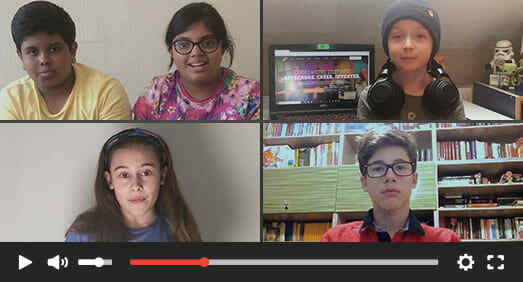 Kids have fun learning online, creating and innovating with us. Don't take our word for it - listen to our students' experience! Students will get to know the learning environment. They will start by creating simple stories involving no more than one character and gradually progress to programming advanced games that combine multiple characters, commands and design tools. 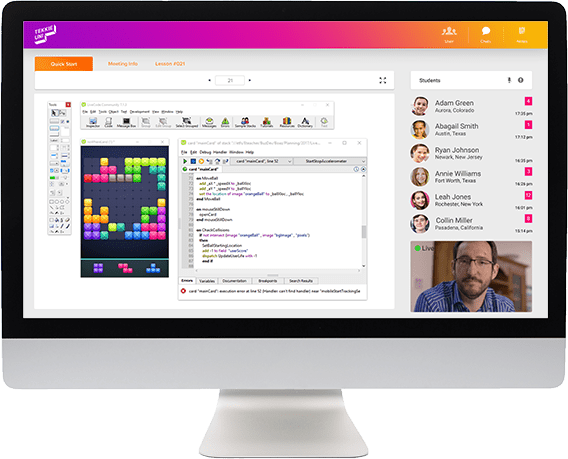 Scratch is a popular web-based visual development environment, allowing children to create animation, games and music by using drag-and-drop component blocks that are actually units of code. Providing multiple choices of characters, backgrounds and design tools, Scratch invites kids to create interest-based projects, share and discuss them in the online community. Say Hello Introduction to Scratch. Students will get to know the teacher, their classmates and most importantly the development environment they will work on during the entire course. Students will learn basic concepts such as: stage, character, event and command. Playing animals Students will create their first project, in which they will choose an animal and make it play an instrument. They will learn commands involving sounds, costumes and sizes. The project is programmed by dragging and dropping built in commands. Students will share their project in the virtual development environment. The Story of Pico and Tera Students will create an interactive story using multiple backdrops (backgrounds), events and timed motions. In order to create their story students will be introduced to the x-y grid (axis). They will learn how to make a character move or turn, how to create an event, change backgrounds and time the various commands. Catch the Worm Students will create a game that combines advanced coding concepts such as: loops, conditions and variables. They will place the characters on the stage by using the x-y axis and create an opening screen for their game. Car Race Students will create an advanced game by using and implementing all the tools they have acquired including: Scratch design tools, conditions, variables, sensors and much more. Math Quiz Students will work on a project that combines random questions, gathering user data and adding animation features to the characters. Final Project Students will write a full script for a character that's made up of two characters. The character is a two-part tank. The challenge is to coordinate the tank's movement and direction using its two parts. TekkieUni’s teachers are highly experienced in teaching coding for children. They are the heart of the class, teaching online with enthusiasm, encouraging participation and happy to answer every child’s question. 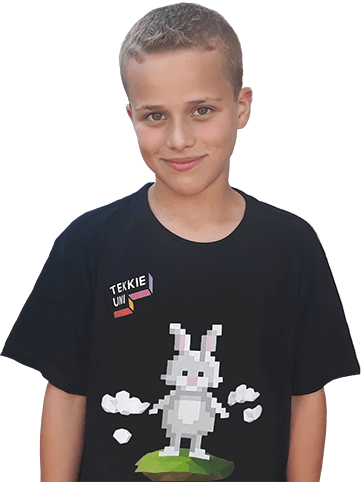 TekkieUni specializes in operating live-online sessions with full real-time interaction guided by an experienced and attentive teacher, because we believe that with a little help every child who wants to learn – can! Learning is all about connecting. That's why we use a video conference software allowing the small size group of children to get to know each other and their teacher. 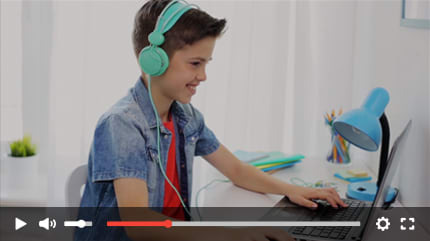 The teacher uses a shared screen option so everyone can see what she is doing on her desktop, and kids can fully participate in the lesson by using the microphone or the chat. In addition to the weekly live lessons, students are invited to join a live weekly Q&A session with a teacher present in class. The session is dedicated to provide personal assistance with students' projects, exercises and questions. All the live lessons and practice sessions are automatically recorded and available for students during the course. Students learn by doing and work on interest-based projects, which create a fun class dynamics where we don't present the answers but look for them together. Interested in our Scratch program? For a limited time we are offering 2 trial lessons and a fully refundable registration fee! The registration process takes a minute and is required to secure your kid's spot in the class. Following the online registration process our academic adviser will contact you to finalize the registration process. My child has no previous experience in coding, would s/he be able to start from scratch? Yes. This course is designed for young children who have no formal experience in coding. We invite all new students to try a few sessions for a nominal fee that will be fully refunded in case you decide not to continue after the trial period. For further information regarding our cancellation policy click here. Class time zones – what time do your classes start? We teach Monday to Friday according to your local time zone. You are welcome to check the schedule and assign yourself to a time that’s most suitable to you. What is the minimum age for online courses? We teach kids aged 8-17. The relevant age group for the “Starting from Scratch” course is 8-9. How can I follow up on my child's progress? All the lessons and practice sessions are automatically recorded. We encourage parents to view the recordings and share their feedback. You can also write an email to the child’s teacher to hear more about him. Do I need to purchase special equipment for the courses? All you need is a working computer with an Internet connection and you’re set. We work with windows and Mac operating systems. For further information regarding specific course requirements click here. The total tuition for the course is ₪3290, however, registration starts with a trial period of 14 days that costs ₪160 which is deducted from the total tuition. Yes. You can make up to 9 monthly installments (with no interest). For more information please contact our customer service center. The trial period is basically the first 14 days of the course. Your child will get to know his teacher and classmates, he will use the learning environments and participate in 2 lessons. What happens if I don't want to continue after the trial period? You can email us at customercare@eteachergroup.com or call us at: 1-646-233-4171 before the end of the 14 day trial and we will reimburse you. Do I need to let you know if I want to continue with the course after the trial period? No. after the 14 day trial just show up to the next lesson and the rest of the payments will be charged automatically.